Enjoy these fruit flavored protein drinks. 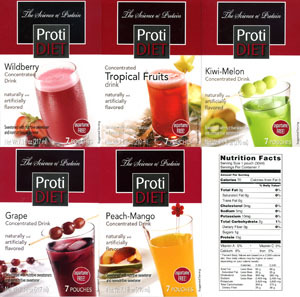 Available in Tropical Fruit, Grape, Wildberry, Cool Raspberry and Kiwi-Melon. 60-70 calories, 15 gm protein, 2-3 gm carbohydrate, 0 gm fat. 5 Individually-packaged servings per box. 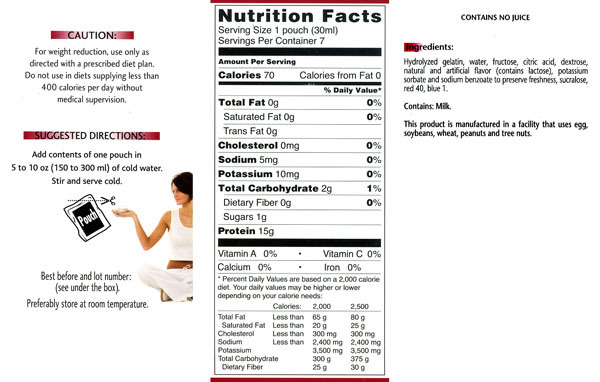 Please note that the label picture enclosed is a sample - products are very similar, but there are slight variations. Click here for ingredients from each flavor. I am really picky when it comes to protein drinks since I don't like Chocolate and Vanilla and the majority of protein drinks come in those flavors. I have been using the fruit drinks for the past 6 years and I LOVE them! Very easy to use and they taste good! !